My score is nearly 15k and I rarely read or answer questions not tagged with Java. I'm also sure that I've answered a lot of questions and scored mostly by answering. So I'd estimate my Java answers score to something like 10k and I wonder if I read the criterium wrong? Changing the tag to "bug" as the text is confusing. Actually, I can't recall having seen "score" anywhere, so one may assume it means "rep" as this is the only well-known thing. But "score" is fine, just make it to a link or add a tool-tip. I though it could mean upvotes rather then points, but even then... but i see my estimation was off by 106 upvotes. I wouldn't have asked if there were no people with a lower score having the gold badge already. I thought I was rather extremely concentrated on a single tag, but I see that there are people even more concentrated. Your total score for answers in that tag, where score is the net sum of all upvotes minus all downvotes you received on answers with the java tag. 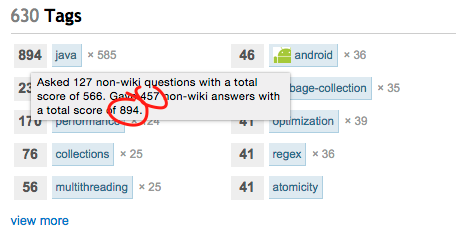 You must have provided at least 200 non-wiki answers to questions with the java tag to qualify. It is not your reputation that is counted here. You can find out your current score by hovering over the tag score in your profile, or by going to the java top users page; your account will always be listed in the top 20 answers rank even if you are not inside the top 20. The scores are updated once per 24 hours, around 03:00 UTC. You need to have gotten at least 1000 upvotes (at least, as score == upvotes - downvotes) on non-community answers on questions that are tagged with that tag. There should be at least 200 different questions where you got such upvotes. Hovering over the score (not the tag or the total post count) will give you a breakdown of the questions and answers score. Alternatively, from the main page for the tag you can click on "Top Users" in the info panel which will give you the stats for that tag. Your current position on those lists will tell you how you're doing (and you will always appear at the bottom of the "All Time" list if you have any score in that tag. Remember that the "Score" is actually a count of upvotes, not total rep gained, so is about 1/10th your rep. gain for the answers. Award tag badges multiple times? Do you lose a gold tag badge if questions are retagged?